Transportation is constantly changing. The year 2002 brought us Segway Personal Transporters; 2009 gave us Uber (formerly “Ubercab”); 2010 brought bike-share companies to the U.S.; and 2017? Scooters. Yes, the same toys we used to ride around our neighborhoods as kids have now become electrified and are the newest, hippest mode of transportation in at least 21 states of the U.S. These electric scooter companies — namely Bird, Lime, and Spin — are taking cities by storm in recent months. People from the company drop off dozens of scooters at “nests” located around the city each morning for civilians to pick up. The person can pay through the app the $1 starting fee, ride it around — paying additionally by time or mileage — and then just drop the scooter off wherever he or she would like. At the end of the night, the company collects the scooters around the city to check for maintenance and repair needs and then deposits them around the city streets the next morning. At first blush, this idea seems great! Avoid traffic, get to a close distance quickly, and for cheap! Upon closer observation, however, just as the scooters seem to be taking over, more and more problems are quickly emerging with the newest toy-turned-transportation. First, safety. There have been numerous accidents reported in the last few months as the scooters have become more readily available to the public. The websites and apps for these scooters suggest the riders should wear a helmet; however, there is no method of enforcement from the businesses, and when a person picks up a Bird to ride around town, a helmet does not come attached to the scooter for a rider to wear, and people walking around downtown are likely not already carrying a helmet with them when they get the urge to pick up a scooter. Bird only provides a helmet when a rider puts in a request for one. Personal injury attorneys across the country are reporting dozens of people seeking representation after getting injured on these scooters, and liability and insurance surrounding this latest mode of transportation is a relatively uncharted territory for these attorneys to try to manage. Liability can be hard to prove, and questions of insurance coverage for injuries can be tricky to answer; health insurance will say that car insurance should cover medical expenses, and car insurance points the finger back saying it won’t cover a crash on a two-wheeled vehicle. Oddly enough, according to one personal injury attorney, it’s possible that homeowners or renters insurance could cover a rider in these situations. 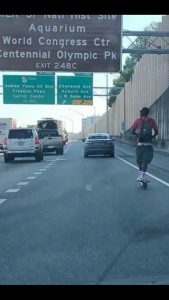 Another attorney says that though Bird says that riders use the scooter at their own risk and limit its own liability to $100, the company’s waiver likely will not stop claims of gross negligence. As if the safety concerns were not enough to label these scooters an official nuisance, the legal concerns may do it. According to the Official Code of Georgia, the operation of motor scooters is only mentioned once under the definition of “motor driven cycle” which also includes motorcycles, bicycles with motors attached, and mopeds. 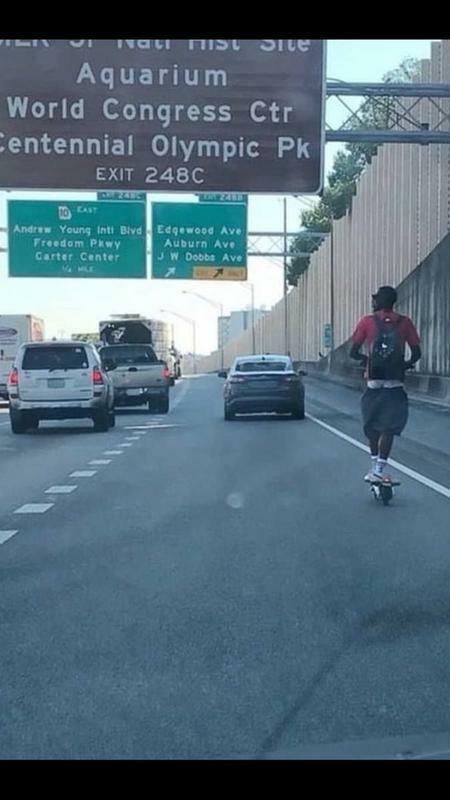 Clearly, these newly innovated technological devices (electric scooters) have yet to be addressed by many state legal codes. Because of the lack of specificity in the Code regarding the definition of electric scooters, cities around the country are interpreting law one way, and the scooter companies are interpreting it the other way. The companies do not want riders using the scooters on sidewalks, and the Cities don’t want the riders using them on streets. Additionally, confusion over whether the scooters need license and registration has been at the center of much debate over the legality of the scooters. One of the main legal concerns and problems the cities and public are having with the electric scooters is the sidewalk litter they cause. Because a rider is able to pick up, ride, and drop off the scooter wherever he or she pleases, the “dockless” nature of these scooters is causing sidewalks to fill up with scooters disposed of by inconsiderate riders, blocking pedestrians’ and wheelchairs’ paths. Though many of the legal concerns are up for debate right now, the issue surrounding the blocking of the sidewalk is not one to be misinterpreted; O.C.G.A. § 16-11-43 says it is illegal to recklessly obstruct any “sidewalk, or other public passage in such a way as to render it impassable without unreasonable inconvenience or hazard” and failure to remove the obstruction — namely, the electric scooter left lying in the middle of the sidewalk — after an official request to do so is a misdemeanor offense. Have You Been Injured by a Metal Plate on the Street Yet? 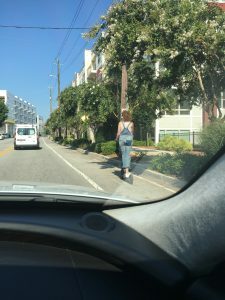 It’s only a matter of time before you or a loved one is injured by one of these nuisances that are so prevalent on Atlanta city and county streets these days. Or it’s just a matter of time before you damage your car from driving over one of them. The ubiquitous metal plate. Who thought these were a good idea in the first place? The metal plates in the photographs above are currently on my street, Oakdale Road in unincorporated DeKalb County. These two metal plates have been there for months. And notice there is really nothing hold them in place other than the mere weight of the things and gravity. But a truck that ways 60,000 pounds loaded, or an SUV that weighs 10,000 pounds or even a small car that weighs 6,000 pounds going 35 m.p.h. can easily move these plates when they are not pinned down. Once moved, they become a potentially fatal hazard to the motoring public. Imagine coming upon this monster (see photograph below) as you mind your own business driving down the road. Once your car ran over it, you and your car wouldn’t stand a chance. 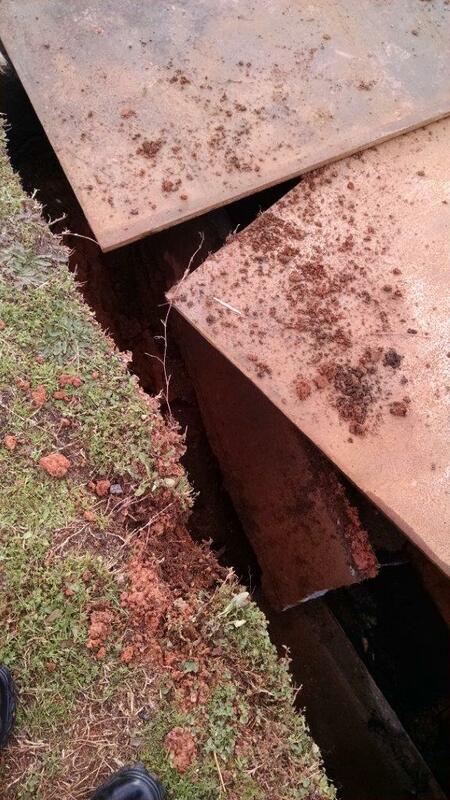 The weight of your car would cause the metal plate to flip and your car would fall into the sinkhole below. It is doubtful you could escape without serious bodily injury. The photographs below show several metal plates that are clearly not pinned down or held down in any way whatsoever. Car and truck traffic have obviously shifted them, so that the next unknowing driver, potentially YOU, could be swallowed by the hole they are supposed to be covering. I am confident this is not an isolated situation; my guess is that you have seen the frightening scenario below multiple times. 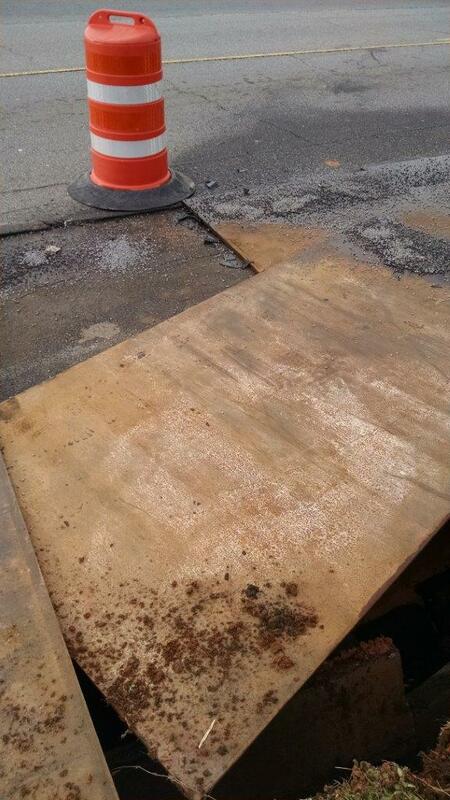 There are actually requirements for the way these metal road plates are required to be placed on the roadway. For example, steel plates must be fixed in place to avoid movement. In addition to being firmly in contact with the pavement, they should be either pinned, recessed into the pavement, or secured with asphalt wedges around the perimeter. Pinning into the pavement involves driving pins into the pavements along the edges of the steel plates to prevent movement. Recessing involves cutting out the area where the steel plate will be placed. If these are the mandatory requirements for use of these monsters, why are they so seldom pinned down or recessed? As a member of the motoring public, you are entitled to assume these plates have been put down and affixed to the street properly so that they are safe for you to drive over. The law does not require you to drive around them in an effort to avoid them. Remember the “Pothole Posse” formed by then City of Atlanta Mayor Shirley Franklin? It seemed to make progress for awhile, but after the initial excitement about bringing back safe streets, we are right back where we were with our streets littered and cluttered with these metal plates. Recently, in New York, such metal road plates may have played a role in a fatal crash that killed six people.